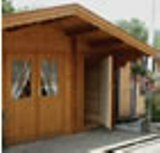 This fantastic Turin log cabin with porch is an excellent building designed for many uses. The building has an extensively glazed double doors to the front with Georgian bar finish. For excellent light there are three French windows all with a turn cant mechanism. There is also a smaller window with a turn point mechanism. All windows have traditional shutters. 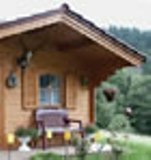 Within the log cabin there is an internal door between rooms. 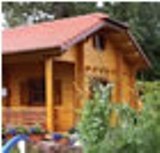 This log cabin is made to order which means many options are available for example, extensions, porches, canopies, brass Georgian bars between the panes, flower boxes, paint colour and roof tile colour. 3 French windows, double glazed with Georgian bars. Supplied with good quality roofing felt. Felt tiles in a choice of colours are available as an option. 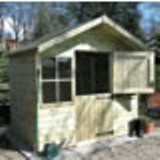 A Traditional Potting Shed 8'x6' (2.43x1.83m). Many options available to apapt this versatile building. 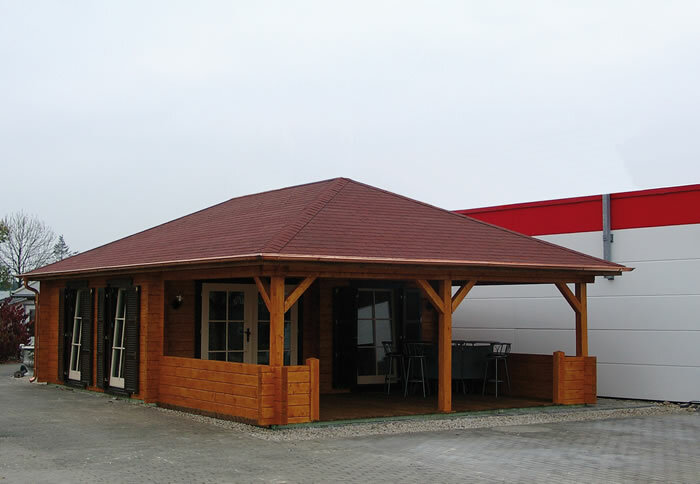 This Kenn Flat Roof Gargen Building measures 9'10"x6'7" and is available in many larger sizes. This attractive rustic arch features a pointed top and lattice sides. Handy Poly Body Dump Trolley with useful tipping facility, ideal for transporting items around the garden.